Purchasing a sectional can be a such an overwhelming task, but this one is a beautiful choice that can make your choice so much more simple. With 3 reclining pieces, an armless chair, a corner wedge and a handy console with USB, it has everything your busy family needs. It's well-tailored with clean lines, not lumpy like so many other options. The fabric is durable and easy to clean. 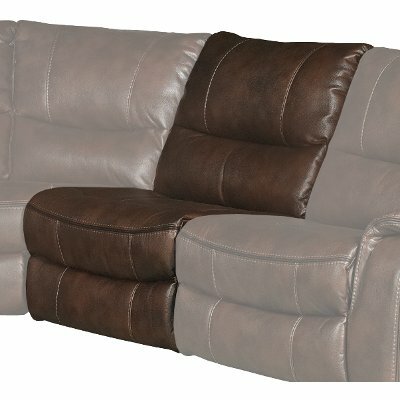 Brown 6 Piece Power Reclining Sectional Sofa - Wayne is rated 4.1 out of 5 by 11. Rated 5 out of 5 by wf1985 Seriously love it! So I’ve only had this couch a couple weeks now, but so far I LOVE it. Never got to see it in person as I live out of state and didn’t want to make a special trip to Utah just to look at it. So I ordered it just hoping I could live with it, and it did not disappoint. Even better looking in person than the online picture. I’m not a fan on “leather” sectionals, sofas, love seats, etc... but with two dogs who are always somehow dirty and a toddler who insists on dumping her sippy cup on the couch every time I turn around, a couch like this was necessary. I love the color of it! It’s a nice brown and almost has a two tone look to it. Looks great in my house! It looks very nicely made, and not cheap or cheesy at all. And I must say, in my personal opinion, it is very comfortable! Most couches like this I have tried out in the past are stiff and hard, but this one is so comfy and the seats are big enough to fit 2 people. I have gone through so many couches in the past because I have never found one I truly love, but I have loved this one since they first set it up in my living room! I cannot attest to how this product will hold up over a long period of time since I’ve had it only a short while still, but I hope it holds up and is as nicely made as it looks! Also, the salesman who sold it to me over the phone was great. RC Willey’s customer service never disappoints! Rated 4 out of 5 by Dawgyyyyyyyy Pretty good. Couch is comfortable and looks great. Appears to be well built. Rated 5 out of 5 by Ponchrides Excellent sofa This is a fantastic couch. 4 or 5 people can easily sit on it. The recliners operate smoothly. The material is durable. It's very stylish and looks like it would cost much more than it actually did. Zero complaints. Rated 5 out of 5 by Iwatchfootball Love this product Wayne was exceptional in helping us decide. We made a great choice and love this sectional. Thanks Wayne. Rated 4 out of 5 by browncouch01 Good Value The couch is very lightweight and can be moved fairly easily. However the handle sleeve in the middle is not very sturdy a piece has already broken off, it is plastic and should be medal. The delivery guys did not offer to put the couch together, I would like to see them offer this as this couch is a bit hard to interlock the pieces. Other than that the couch is very comfortable and looks very nice. 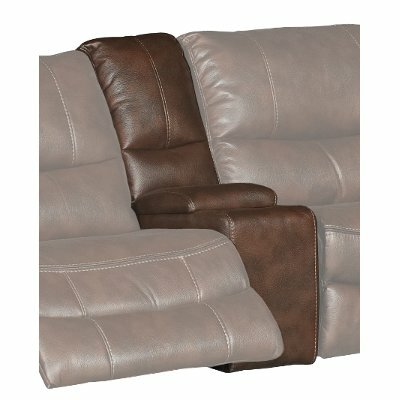 Rated 5 out of 5 by willieboy74 3 piece sectional. Great purchase for us. Product is comfortable, great looking and in our price range. We have 3 big dogs, dirt and dog hair wipe up easily. We shopped around for 2 months looking for the right product. Delivery was great, customer service was great! 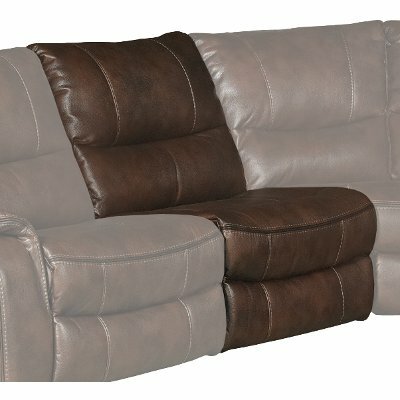 Rated 5 out of 5 by TheMartman Great Quality Great looking furniture, best quality sofa set the wife and I have purchased (and we've purchased quite a few). Sectional was too small for the size of room and it was easy to just add additional pieces until it was just the size we needed. Haven't had a single issue since it was delivered. Totally happy with this purchase. Rated 1 out of 5 by a1iralda Worst furniture ever purchased We purchased our couch a little under two years ago. Instantly we noticed issues. Cushions sink in, back hurts, arm rests pull from chair's, grinding noise from motor, threads coming apart. I honestly can't say one descent thing about this furniture. I definitely DO NOT recommend this sectional couch! Rated 1 out of 5 by Sallyooo Very uncomfortable sectional This sectional is very uncomfortable, I would have never bought this sectional if I had sat on this chair for 30 minutes. Rated 5 out of 5 by NVNUC63 Comfortable and good looking We are very happy with this couch. It is comfortable and holds its shape very well. 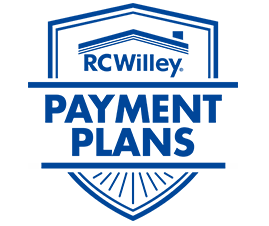 We were happy with our sales associate at RC Willey, he was knowledgeable and helpful in our making a choice as to which couch to purchase. Our experience overall was excellent. Rated 5 out of 5 by Persin Great Sectional! I've looked at so many different sectionals, all prices, all types of layouts and fabrics that I felt sure I'd never find the exact one for me. Until...I found this one at RC Willey! My salesman, Terry, was, as is his usual very, very patient with me. I had to sit in every single one and play with them. This one really fits me. I have tons of back problems...but not sitting in the recliners. I opted for two of the little cup holder pieces so now everyone can have room for their cups, a spot for remotes and even USB ports to charge our equipment. One thing I love is that it all moves forward, so you can have the sectional right up to a wall yet never touch it. The leather like fabric is not as cold as leather, and with the contrasting stitches it looks extremely well made and expensive, although it sure wasn't that expensive. What can I say? Total comfort and with the powered recliners (3) it is effortless to move to your exact perfect spot to view TV or read or just relax. WE LOVE IT!